Get your Downward Dog on in the middle of a jungle or practice your Sun Salutation overlooking the ocean. Yoga vacations in Costa Rica are an incredible experience and we can help tailor the right one for you. 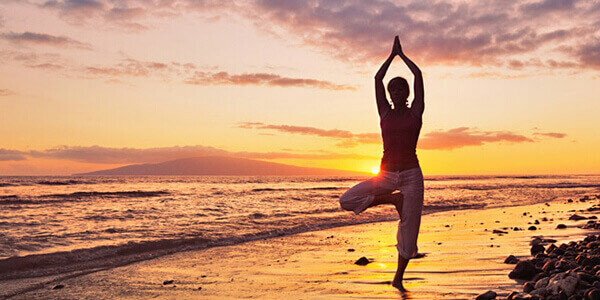 What better way to relax, unwind and reconnect with nature than by embarking on yoga vacations in Costa Rica? With some of the most stunning scenery in the world, these unique getaways will allow you to restore balance to your life and explore a new sense of peace and inner calm. When it comes to finding your center amid the most incredible surroundings the country has to offer, Soothing Escape is hard to beat. One of the best yoga vacations in Costa Rica, this package allows you to experience a whole new level of personal growth and relaxation. You’ll stay at two of Costa Rica’s most luxurious and secluded villas during this eight-day vacation. First, you’ll stay at the Villa Blanca, a peaceful and remote guesthouse nestled in the mountains of Costa Rica’s Central Valley. Sustainability and natural balance are central to Villa Blanca, which is designed to mimic the traditional farms that can be found throughout this verdant region. Fresh produce and numerous crops are grown on-site, and the villa’s restaurant uses these fresh ingredients to prepare tasty, balanced and nutritious meals. After staying at Villa Blanca, you’ll travel to the Nicoya Peninsula, where you’ll be able to take yoga lessons from experienced instructors at the secluded Punta Islita guesthouse, nestled deep in the heart of the Nicoya jungle. The Harmonious Retreat vacation package is centered around the remarkable Harmony Hotel in Nosara, a remote town on the Pacific Coast in Guanacaste. This eight-day tour is perfect for stressed-out travelers seeking a way to unwind and experience lush tropical scenery. Each of the suites at this charming and rustic villa are located along a path that winds through beautiful tropical garden, and the pristine white sands of Nosara are just a few minutes away. The Harmony Hotel offers a range of yoga-related activities, including classes for novices or spaces where experience yogic practitioners can relax in harmony with nature. Tropical Ashram package is ideally suited for individuals familiar with yoga, and remains one of the most impressive yoga vacations in Costa Rica. It includes stay at the Xandari Resort & Spa in the Central Valley and luxurious Latitude 10 Jungle Beach Resort in remote Mal Pais. Here, you’ll be able to participate in daily yoga sessions, relax with a massage and other indulgent spa treatments, or just experience the simple pleasures of wandering through the lavish gardens, and unwind after a long day on the beach. Latitude 10 is one of the finest resorts in Costa Rica, and you’ll be able to work on your asanas and breathing exercises as the gentle soothing sound of the waves calms your spirit. Modern life can be hectic, and we all need time to reconnect with our inner selves. Costa Rica vacation packages with yoga are the perfect opportunity to explore new depths of peace, tranquility and inner calm amid beautiful scenery. Visiting Nicoya Peninsula is a perfect way to disconnect and get away from it all. There are numerous secluded spots in this remote region and most of them are beachfront. If you’re looking for a rainforest getaway, El Silencio Lodge and Spa, located in a tranquil setting of a cloud forest just one hour from San Jose, is a great option, too.